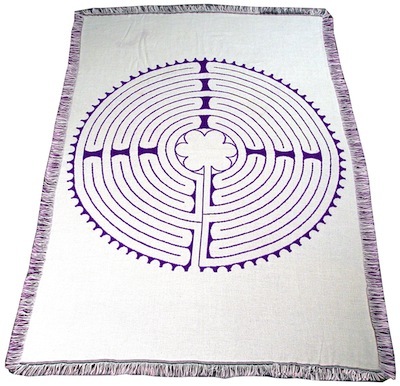 These unique and beautiful, 48″ x 67″ all cotton, woven, reversible Chartres blankets are warm, cozy and sure to cover your labyrinth enthusiast, favorite chair, wall or bed with style. 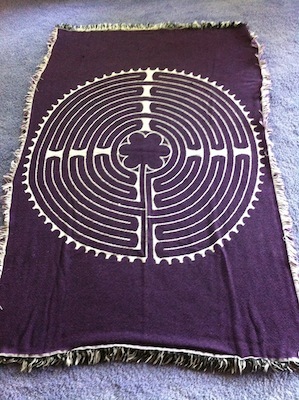 Each about the size to cover a twin-size bed, these reversible Chartres blankets are purple and white. Set of 2. During the 13th century, this design was inlaid into the floor of Chartres Cathedral in France. It was adopted by the church during the Middle Ages as a substitute for the physical pilgrimage early Christians made to Jerusalem. The 11 circuits & center may represent the 12 apostles. There are 113 teeth known as “lunations” which adorn the outside of the pattern and many believe the ancients used these lunations as a sundial in order to determine the lunar feast of Easter. The center area (rosette) is a six-petaled rose that some believe represents the Virgin Mary or cosmologically, the six kingdoms of existence; mineral, plant, animal, human, angelic, divine. It is thought that by spending time in a petal representing a kingdom that embodies a quality that you are trying to emulate (i.e. the mineral and plant kingdoms teach us patience), you will come to better understand that quality. The green plastic Chartres labyrinth design frequently takes you close to the center and then back towards the outside of the design. This pattern can represent coming close to and moving away from your personal, transformative center, a place of intense knowing and change.